Curiosity rover is distracted by shiny objects: Mars Science Lab stops scooping dirt to investigate an anomalous bright object on the ground. Quite obvious that it’s a prawn head…I’ll set to work on the District 9: Origins script immediately. Private rocket company SpaceX acknowledges problems with yesterday’s launch, including debris from an engine failure. Global Consciousness Project finds significant result during Burning Man 2012. Dan Brown fiction coming to life? Pope’s butler was fascinated by Freemasons, spies, and the occult. Organism without a brain creates external memories for navigation. Wasp’s tiny brain is a mystery of physics. Spider attack caught in amber is a freeze-frame from 100 million years ago. Submariners surprised to spot a diving bird 150 feet (50 metres) underwater. Dog tracks down ailing owner at hospital two miles away. Humans may be one of the early intelligent species in the Universe. Or one of the dumbest. Astronomer wants UFOs studied with science. But what if their science is bigger than our science? More evidence that Voyager has left the Solar System. Take that Elvis! National Geographic Society members start to ask questions about the NGS’s relationship with Zahi Hawass (Part one, part two). Powerful magnets can switch off cancer cells. Signs of the coming robopocalypse: co-ordinated quadcopters throw and catch balls. Decoding secret societies: what are all those old boys’ clubs hiding? Christopher Columbus was an a-hole. 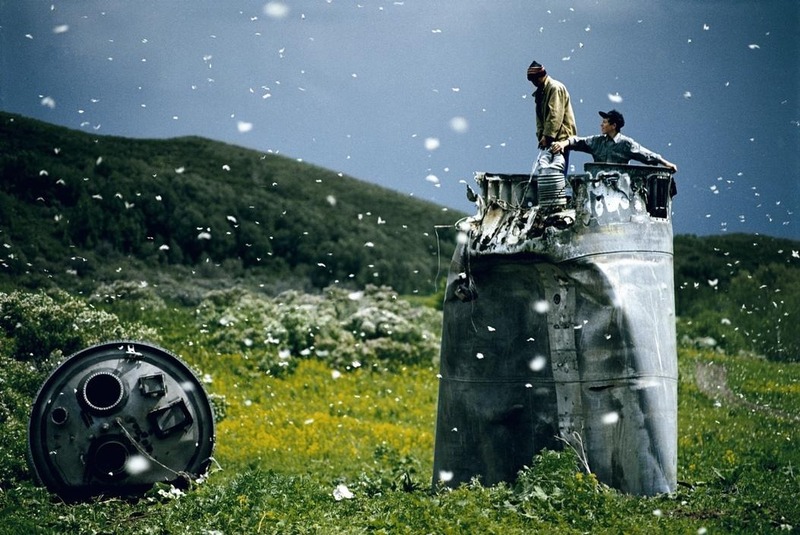 Image of the Day: Russian villagers collecting scrap from a crashed spacecraft, surrounded by thousands of white butterflies. I’m sorry but as a nerd who collects bottles I would like to mention that the reason they turn purple is because the mixture of glass contains manganese, where as today it would be more likely made out of cheaper selenium. it takes almost 100 years to start to turn “purple” depending on the thickness of glass, how long it was in constant sunlight, and the percentage of manganese in the mixture. They continue to turn color until they get “black.” Selenium consequently turns it yellow.